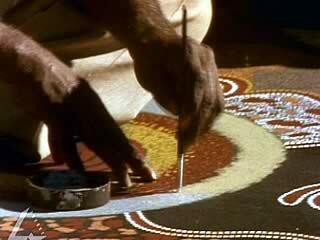 Comment on how the painting being created by artist Michael Nelson Tjakamarra represents the land and the features within it, such as the representation of his people, or “skin group”. Describe the artist’s aim or purpose in creating the painting. What role is Tjakamarra fulfilling as a member of his skin group, as an educator and as the father of his own children? Define the way in which the filmmakers of the video clip use the elements of filmmaking itself to draw a link or connection between the natural landscape and traditional art. What purpose do you think this has for us as an audience? In pairs research examples of traditional Australian Indigenous art that derive from a specific locality or geographic region. Prepare an informative written and illustrated report of about 500–700 words discussing the various features of the art, and the ways in which it expresses elements of the Dreaming.